Chain mail (or chainmaille) has gained a lot of popularity in recent years, due to a surge in interest in all things medieval and fantasy. From the Lord of the Rings to Dungeons & Dragons, chain mail has become a big part of many people's fantasy world. For those who play role playing games such as Dungeons & Dragons, they may need to carry dice for the game. Learning how to make a chain mail dice bag can combine many of the different loves of the fantasy world. Purchase your supplies. Most craft stores do not carry chain mail jump rings; you have to purchase those online or search for a specialty retailer. You will also need to purchase a ring spreader--a small device made for opening jump rings. Many of the other tools, such as needle-nose pliers, can be found at any craft store. Decide on a weave. There are many different types of chain mail weaves, ranging from simple to complex. 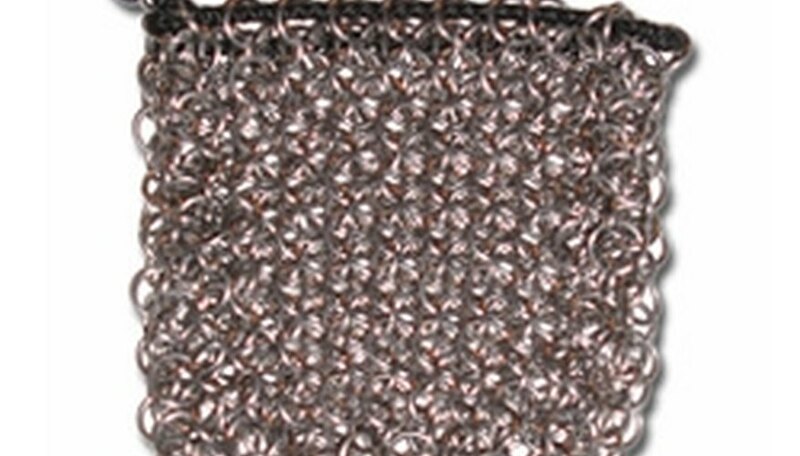 The 4 in 1 is the most commonly used chain mail weave for dice bags. In this weave, four jump rings are attached to a center ring. The pattern flows outward to create a fabric. Choose a pattern for your bag. As creating a 4 in 1 pattern will just make a sheet of chain mail, you will need to find a pattern for the bag that allows for shaping your mail. You need to decide on the size as well as the depth and shape of your bag. Begin creating your chain mail dice bag. For a beginner, this is a tough task. You will want to try to just work with a few rings, one at a time, to create a length of 4 in 1 chain mail. Spread the rings open with a ring spreader, using five rings--one will not be opened. Attach four rings into the central ring, and close the rings with pliers. After you have mastered this, you will weave enough rings together to create the body of the bag. Create a piece of chain mail that is large enough to be the body of your bag. Then, using a contraction method (using a 3 in 1 weave and then 2 in 1 weave) taper the bag down so that it has a rounded bottom. Finish your bag with a length of cord or other type of drawstring woven through the open end of the dice bag. A clasp can be used to hold the string in place. You can now use your chain mail bag to stash dice or any other important items. Weaving chain mail is a tough craft to master and takes a lot of practice. Don't be discouraged if you have difficulties at first. Weaving chain mail is an expensive hobby--especially when first paying for the tools and supplies. Victoria Clayton has been writing professionally since 2003, serving as a featured writer for various online publications. She is pursuing a B.A. in human development from Empire State College.